One of the "things" about the Cape is fog. It is part of our life here. 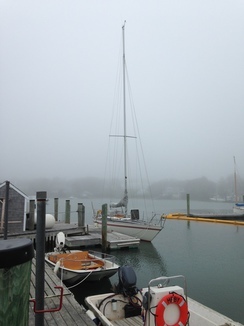 If you are on the water, fog is a constant threat. Before GPS and the high quality charting we now have, fog was the curse. 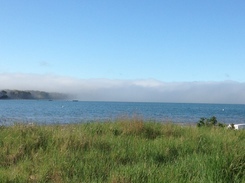 today, May 21, we were at the beach at Red River on Nantucket Sound and the beach at Muddy Creek on Pleasant Bay to see some of the offshore fog working its way on shore. The fog looks like mountains in the distance. 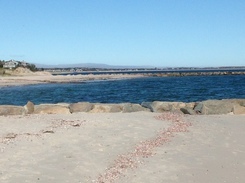 This view is from a Nantucket Sound beach, Red River Beach, Harwich. As we drove in to the parking lot, Elizabeth asked where the mountains came from? After Red River, we nipped over to Muddy Creek/Jacknife Beach on Pleasant Bay. Anyone who is familiar with Route 28 as it goes from Orleans to Chatham knows the thin stretch of road that is Harwich. That's where the beach is. Norm loved this beach as a kid. His kids loved it and now our grandkids are asking to go there, too. The fog completely obscured the islands in the Bay and the outer beach. 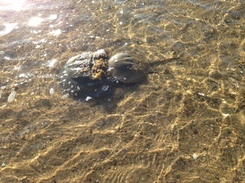 Horseshoe crabs "coupling" in the warm waters of Pleasant Bay. The end state: at rest in Stage Harbor, Chatham, MA. Averisera's new home for a while. The day before departure, we went over to the BSC docks, said good bye to old friends and had a nice visit with Neli and Vasily aboard their boat, Katrina. Norm met Elizabeth the same year N & V arrived at BSC. We became friends and have enjoyed the business of becoming grandparents at the same time. Sailing and cruising are all about the people we meet. 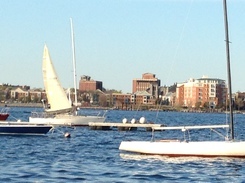 May 7th, view across Boston Harbor from our overnight berth at BSC. Thanks, guys. May 8th approaching the Cape Cod Canal. The weather went from warm and flat calm to overcast and windy and quite cold in about twenty minutes. We still had an hour to go. Upwind, of course. 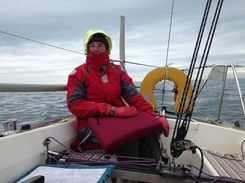 After docking and chatting with other sailors, we made our way up to the Pilot House Rest for some warm drinks and chow. 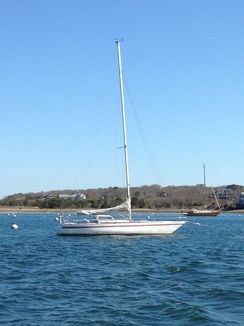 May 9th, we sailed through the Canal and Woods Hole into Nantucket Sound. Well, we motor-sailed in light headwinds... Elizabeth's son, Zachary works at Harwichport Boat Yard. Mid afternoon he called and said there was a quiet berth ready for us. We said, "thanks," and went in to tie up for the night. It was so nice to see him again and meet some of his coworkers. The next day, the three of us took Averisera around the corner to Stage Harbor. 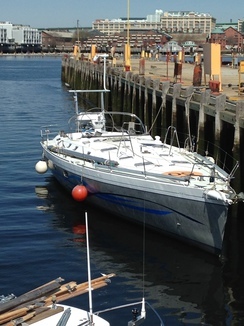 May First, we launched from the Boston Sailing Center Boat Yard in East Boston. I took some video which won't load to the web page. A picture of "Bob and the Crane Boys" getting ready for the splash. 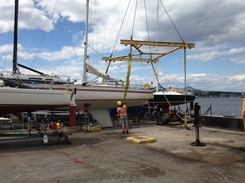 Friends on Sea Dragon, a Cigale 16 had their mast stepped that morning. We can fit Averisera inside of their boat. Next up is to sail our boat from East Boston to Stage Harbor.